The finder link above takes you to an app store page. It would be nice to know how to refresh finder manually. Thanks. Fixed the typo, sorry about that! There isn’t a perfect way to refresh Finder windows though, basically going back and forth in a folder directory structure is the most common way. Command Up Arrow then Command Down Arrow is a quick way to do so in the Finder. My solution to have a F5 reload page in Safari was to assign the key in System Preferences. System Preferences. Keyboard. Shortcuts tab and then App Shortcuts. Click the + tab to add and up comes up box to select Application – Safari. Menu Title box which has to be exact wording as “Reload Page” with both words capitalized and in Keyboard Shortcut box press the F5 key and then the Add tab. I am lazy wanting to use one finger and with F5 being a standard reload for many thinks I press it instinctively. I also set the forward and backward arrows on the keyboard under the Shift key as Safari page forward and backward one button function keys. Like with the F5 setup the wording must be exact “Forward” and “Back” and then press the forward and backward keys on the keyboard to assign them and the add tab and done. Windows can do in a single keystroke what macOS requires TWO keys to do, proving once again that Windows is the superior OS. Have never had a blue screen on macOS ..
Command + R also refreshes a web on Safari for iOS on iPad when using an external keyboard or the Smart keyboard. Command + R will Reload a website in Firefox, Chrome and Mac OS. But Hard Refresh the website page then press Command + F5 in Firefox, Chrome and Mac. AppleScript can also refresh a Finder window via the ‘update’ command. And an AS script can be run via a script menu (where a hotkey can be assigned) or even from the command line in Terminal. Another way to reload a page in Chrome / Firefox without cache is to press function + 12 > Network > check box “Disable Cache”. This want be much of a help to average users though. What a load of old tosh. Notice all the above nerds are male women worry about important things like what’s for dinner and fashion. What’s a cache anyway,? Cache is temporary storage by an application. Refreshing cache is necessary sometimes. Refreshing something without cache means that the application dumps the stored cache (possibly old date) and refreshes it anew. This is particularly important for things that change often and for developers, whether for web sites or applications. Also a common troubleshooting necessity is to dump cache of a browser or another app. 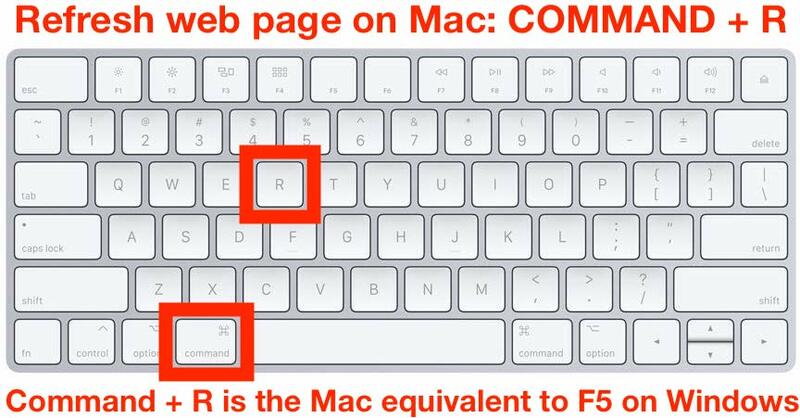 The real pisser is that F5 used to work in Mac OS. I don’t know when it started to change, or why, but browsers (even Safari at one time) used to respond to both Cmd+R and F5.